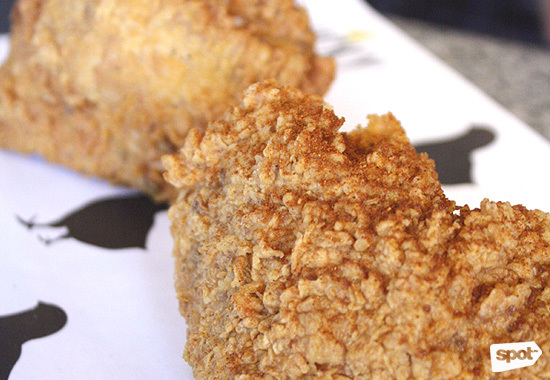 Fried chicken is definitely good luck. 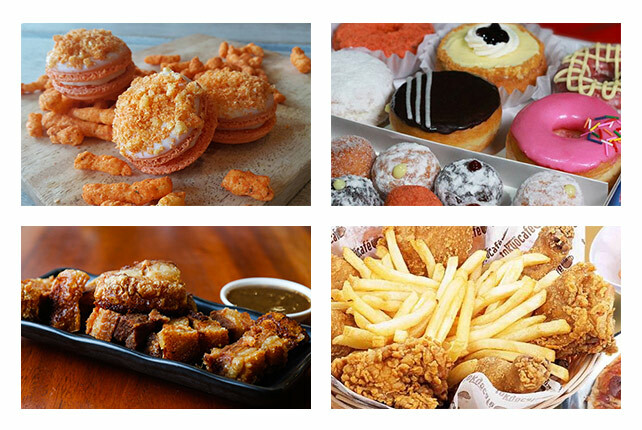 (SPOT.ph) There’s not much to say about Lucky Chick. How many times, after all, can you mention “crispy, juicy, and good” without sounding like a blubbering fan? That’s how they cook the chicken, partial to the crunchy kind of frying that leaves the skin luxuriously golden. Think of everything that’s great about fried chicken, and you’ll probably find it at this fowl cafeteria. Luck is only as far as a drive to UP Town Center (that is, after you find a parking spot). Lucky Chick used to be Skull and Bones, a frat house-styled eatery that tempted you with gourmet versions of all the good junk you carelessly enjoyed in college (fancy hotdogs, chef-made Twinkies, CupCakes, and Moon Pies) and the promise of beer pong. 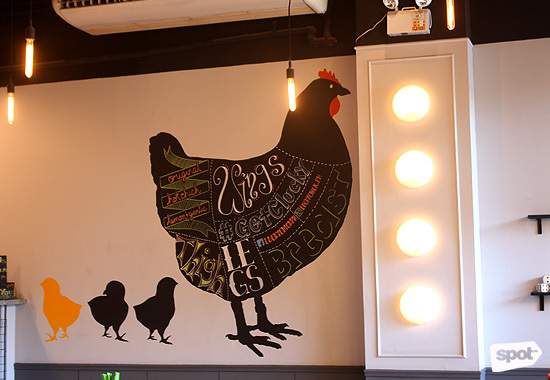 The concept eventually got sidetracked, and the owners wanted to veer their customers back to classic and fun comfort food—through fried chicken. 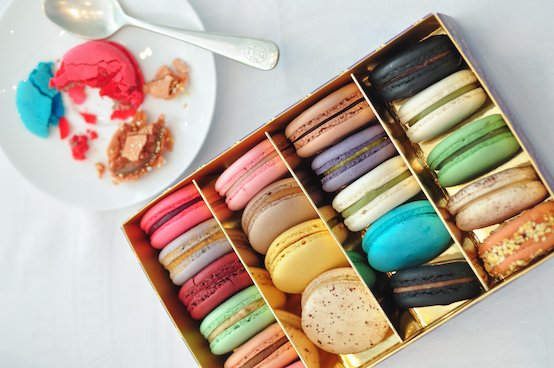 Chef Francis Asuncion’s gilded showpieces appear refreshingly old school. Deeply flavored meat hides under a crackling blanket of skin. 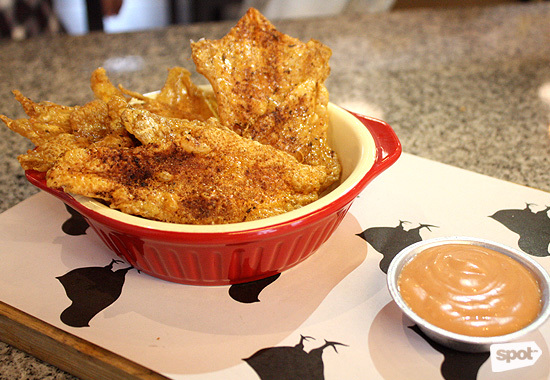 It bodes well to know that Lucky Chick offers their chicken skin (P120) separately, several pieces of lightly spiced chips that are flattened and presented in their naturally crispy glory. Two things go on in his seemingly straightforward chicken (P138 to P988). 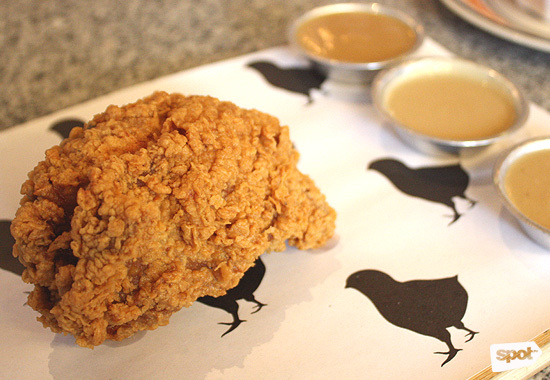 Instead of buttermilk, the chef uses the fermented yeast from his own sourdough starter to marinate the poultry. 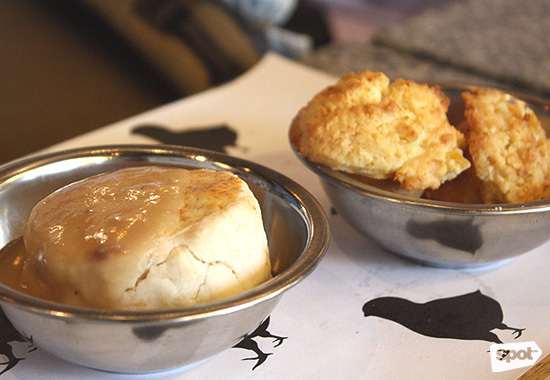 “Buttermilk is hard to get and sometimes, it’s inconsistent,” he explains. Apples figure in his sourdough, imparting a different flavor in the chicken, which is further brined for 12 hours. 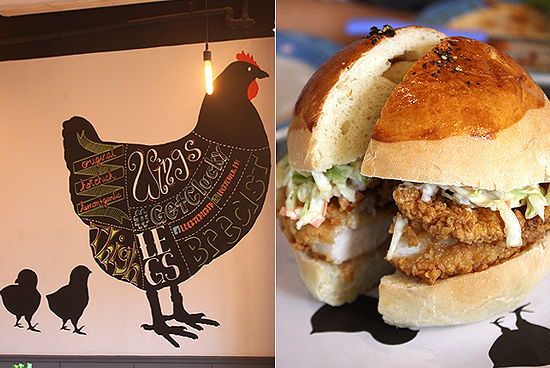 Lucky Chick definitely puts their star to work—creating blockbusters in salads, sandwiches, and meals. Everything is brined, breaded, and fried with the same level of devotion. 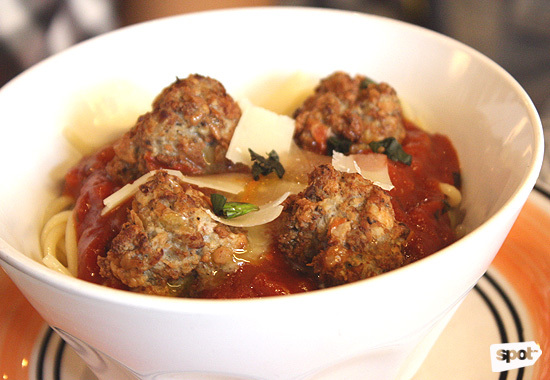 Brothers and owners Patrick and Mikko Santos get a little cheeky with the Spaghetti and Meatballs (P180), which they confess takes its cue from popular fast food. Theirs, however, is in an appetizing and assuring shade of orange, with a flavor so nostalgic, you’ll look for the cut-up hotdogs. Not that the meatballs swimming in a tangle of al dente pasta aren’t delicious. The Hot Chicken is definitely the scene-stealer of the group. Spices are added in the brine itself to produce a more substantial punch, with chili powder settling itself between the flaky folds of the skin. Peppers tickle your mouth with every wonderful bite. 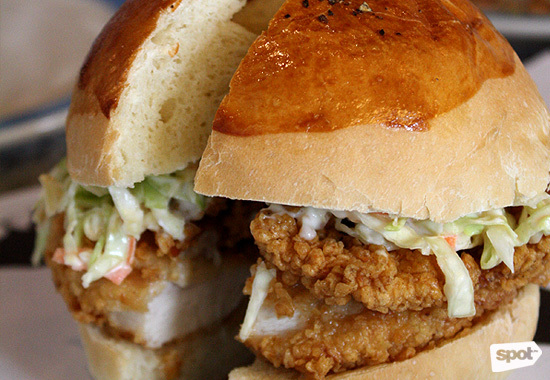 This very same chicken also makes its way between two homemade buns for more convenient enjoyment. You’re allowed to "make your own luck" at Lucky Chick. You can choose between three chicken flavors (including the still in-development Lemon and Garlic), dark meat or white meat, three types of gravy (Original, Honey, and Apple Cider), and your line-up of sides. The corn muffins are hardier than what Filipinos have come to expect from this fried chicken tag team partner, but it comes with a lovely caramelized glaze that paints a sweetish touch on the starchy flavor. They also have biscuits—thick, flaky, Southern American style—that Pat and Mikko are determined to pull out from under the shadows of macaroni and cheese and mashed potatoes. 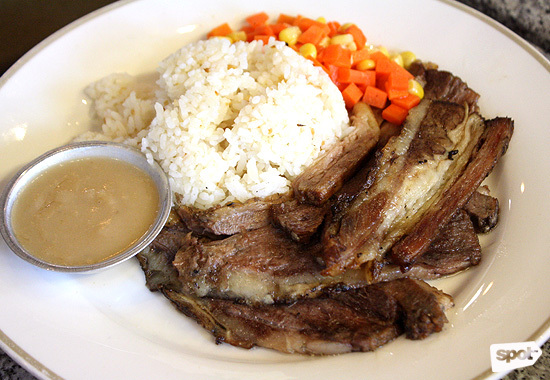 If you can, try skipping the chicken and go with the Slow-Roasted Beef Belly (P310) instead. Chef Francis cooks it for a very careful six hours and it comes with its own gravy. 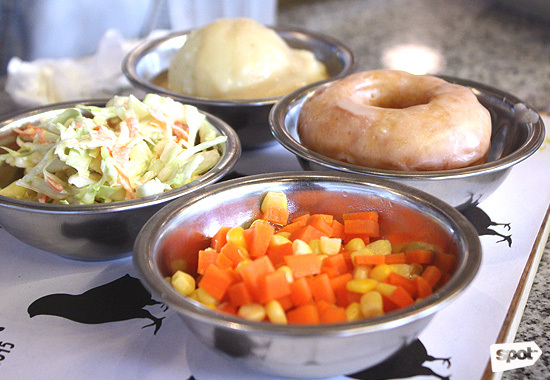 Lard, which makes cameos throughout the menu, is Chef Francis’ second magic ingredient. 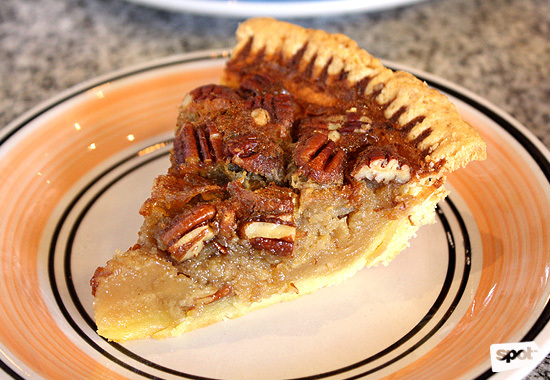 He utilizes it for the chicken, of course, but it also plays an important role in his Pecan Pie (P200), which is forkfuls of not-too-sweet creaminess, chunkiness, and flakiness. The chef gets the pork lard from a butcher and its savory notes neutralize the flavor of the pie. 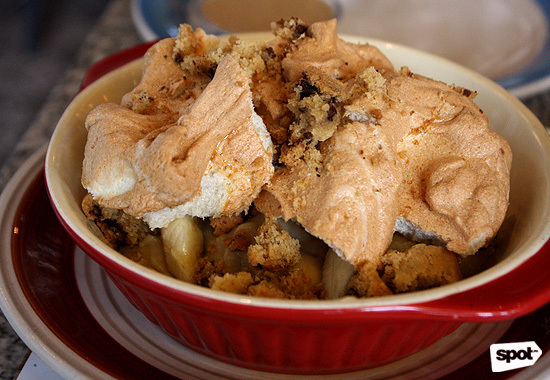 A freshly made crown of meringue, meanwhile, makes the Banana Pudding (P100) a sweeter conclusion. Today’s fashion is all about chicken sporting togarashi, exotic peppers, bonito flakes, or glazes. Lucky Chick isn’t a place for trends. It’s comfort in its simplest and best form—one that you only need to describe in a few words to appreciate.